For ships, see HMAS Mildura and HMS Mildura (1889). Mildura is a regional city in north-west Victoria, Australia. Located on the Victorian side of the Murray River, Mildura had a population of 33,444 in 2016. When nearby Wentworth, Irymple, Nichols Point and Merbein are included, the area had an estimated urban population of 50,998 at June 2016. 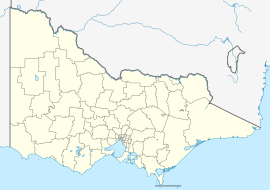 It is the largest settlement in the Sunraysia region. Mildura is a major horticultural centre notable for its grape production, supplying 80% of Victoria's grapes. Many wineries also source grapes from Mildura. The city's central business district is located just a short distance from the banks of the Murray. 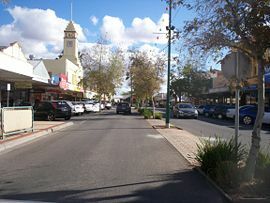 Langtree Avenue is the main shopping and dining precinct in Mildura, with the middle section of the street a pedestrian mall. The other major retail precinct is along Fifteenth Street in the Mildura South area, where a mid-sized undercover shopping mall and several big box stores are located. The city's name was taken from the Mildura homestead, an early sheep station which covered most of the area. The urban area of Mildura is surrounded by irrigated horticulture, where the original grape and citrus blocks were located with water irrigated from the Murray River. Mildura has a long history of orange and grape farming. There are several theories as to the origin of the name Mildura. While it was the name of the sheep station, without precedent in the English language, most historians believe it to have originated from Aboriginal Australian words. However, the etymology of Mildura is not certain, as in several local dialects, the words mill and dura have different meanings. The word dura is generally thought to mean "earth", "sand" or "rock" in the local Ladji Ladji language. However, usage of the word mill varies by dialect and may mean "red" or "water", and thus, interpretations of the name can vary from "red earth" to "water rock". William Blandowski's 1857 depiction of Jarijari (Nyeri Nyeri) people including men hunting, women cooking and children playing near Merbein, Victoria. A form of kick and catch football is apparently being played in the background. 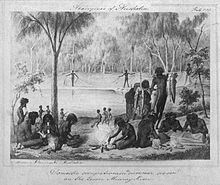 Many Aboriginal people lived around the site of Mildura because of the abundant food. Local tribes included the Latjilatji and Jarijari. The first Europeans in the area arrived in 1857 and brought sheep to graze the rich pastures. A major drought in Victoria from 1877 to 1884 prompted Alfred Deakin, then a minister in the State Government and chairman of a Royal Commission on water supply to visit the irrigation areas of California. There he met George and William Chaffey. In 1886, Canadian-American irrigator George Chaffey came to Australia and selected a derelict sheep station known as Mildura as the site for his first irrigation settlement, signing an agreement with the Victorian government to spend at least £300,000 on permanent improvements at Mildura in the next twenty years. After much political wrangling, the settlement of Mildura was established in 1887. The Post Office opened on 23 January 1888. The bar of the Mildura Working Man's Club was noted in the Guinness Book of Records as the longest bar in the world until 1995 when it was removed during renovations. The nearby towns of Wentworth, Gol Gol, Curlwaa and Yelta sprang up in the mid-to-late 19th century. In the 1890s came the scourge of the rabbit. This devastated the sheep farmers, especially south of the Murray. There was also a financial recession at this time. Combined, these factors restricted growth of the new settlement. After this period, the new settlement grew and grew. It was soon the main town of the district. Suburbs and new satellite towns sprang up. From the 1920s, a number of 'suburban' train services were established to Merbein and Red Cliffs. These were operated by railcars. Post war Mildura experienced a large influx of migrants particularly from European and Mediterranean countries including Italy and Greece. Many of these migrants were attracted by the unskilled labour offered by the fruit picking industry. In 1934 Mildura was officially proclaimed a city. In 2004 there was a controversial proposal by the Victorian Government to build a state-level Long Term Containment Facility (LTCF) for Industrial Waste in Nowingi, approximately 50 km south of Mildura. The site is a small enclave of state forest surrounded by national park, and contains habitat important to a number of threatened species. The abandoning of the LTCF proposal was received with jubilation by opponents of the LTCF not only in the Mildura area and elsewhere in Victoria, but also across the border in South Australia where there were fears that in reputation, if not in substance, the toxic waste could affect the water supply via the Murray River and thereby the fruit-growing industries of the Riverland and Murraylands. The Mildura Rural City Council and residents spent almost $2 million fighting the Government's proposal for the LTCF at Nowingi. On 10 January 2007 the Victorian Government did not rule out some form of reimbursement for the Rural City of Mildura council's legal and other costs in opposing the LTCF. "The general rule is that people bear their own costs, that is most likely to apply in this case ... but I've indicated and I am prepared to talk to the council and mayor about the whole issue of how Mildura moves forward and I'll do that," John Thwaites said. Mildura is situated on flat land without hills or mountains on the southern bank of the Murray River and surrounded to the west, north and east by lakes and billabongs including Lake Hawthorn, Lake Ranfurly and Lake Gol Gol. Several towns surround Mildura on the flat plains including Merbein to the west as well as Irymple and Red Cliffs to the south which could be considered suburban areas or satellite towns separated by small stretches of open farmland. While the land along the river and irrigation channels is fertile, much of the land around Mildura is also dry, saline and semi-arid. Mildura is a largely low-rise and low density urban area that is overwhelmingly dependent upon private automobiles for transportation. Residential dwellings consist almost solely of single-family detached homes on relatively large allotments. The population has been growing rapidly for several decades and most of the residential growth has occurred in the south-western and southern parts of the urban area. The central business district is located at the northern end of the urban area, fronting onto the Murray River. The main shopping street of Mildura is Langtree Avenue, which features a pedestrian mall and shopping centre. However, this shopping precinct competes with the Mildura Central Shopping Centre, located at the opposite end of the urban area on the corner of Fifteenth Street and Deakin Avenue. Fifteenth Street is also the main strip of big box stores and other commercial enterprises. The tallest buildings are the two storey 1934 Old Mildura Base Hospital, two storey Marina Dockside apartments completed in 2010 and the three storey tower/spire of the 1920s T&G building. Mildura has a semi-arid climate (Köppen climate classification BSk) with hot summers and cool winters. It is only about 50 metres above sea level despite being several hundred kilometres from the coast. Rainfall totals are about 280 mm a year and are spread evenly across the months and seasons with Winter and Spring having the most rainy days. Average maximum temperatures range from a hot 32 °C (90 °F) in summer to a mild 15 °C (59 °F) in winter. Minimum temperatures range from around 17 °C (63 °F) in summer to 4 °C (39 °F) in winter, when frost is common and often destructive to irrigated crops. Mildura experiences some very hot days in summer with temperatures exceeding 40 °C (104 °F) on a number of days per year. Mildura got record daily rainfall on 5 February 2011 with 155 millimetres (6.1 in). Grape vines growing in Mildura during December 2006. Mildura is also known as the centre of Victoria's Food Bowl and is a major producer of citrus fruits (especially oranges), and wine. 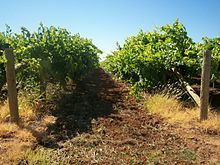 It is also notable for its grape production, supplying 80% of Victoria's grapes. Many wineries also source grapes from Mildura. The local area produces more than 70% of Australia's dried vine fruits. Mildura is part of the Fruit Fly Exclusion Zone, in which fruits or vegetables may not be taken into the area (they can, however, be taken out). This is to stop the Queensland fruit fly from invading crops and plantations which could have a devastating effect on the economy. Disposal bins into which fruit can be disposed of are located along highways entering the zone. Tourism is a A$210 million industry in Mildura. However, a large percentage (30%) are domestic tourists visiting friends or relatives. The city's situation on the Murray River makes it a hub for watersports, paddlesteamers and boat cruises. The still conditions make Mildura ideal for hot air ballooning and the Mildura International Balloon Fiesta attracts many visitors. The Australian Inland Botanic Gardens, located nearby in Mourquong is another popular attraction which draws visitors to the city. Mildura Central’s (formerly Centro Mildura) extensive redevelopment in 2005 has positioned the centre as the major shopping destination within the Sunraysia region. Mildura Central is also the only fully enclosed, air-conditioned centre in this area and offers a retail mix including representation from a number of national fashion stores. Serving a primary trade area population of 60,000 residents, Mildura Central also receives consumers from beyond the trade area including the Riverland, Swan Hill, Robinvale and Broken Hill. It includes a large Target, a Big W to the side of Mildura Central, a 19 aisle Woolworths and a Coles supermarket across the road. Mildura's location in Victoria and consistently strong local lobbying has seen the Government of Victoria take an interest in the city as a possible centre for population and industry decentralisation programs. There have been numerous proposals involving the state government for large scale developments and investments, many ambitious and speculative that have been shelved indefinitely. Given the large amount of sunlight Mildura receives, it is the site for several proposals for large scale solar power in Australia including a massive solar updraft tower proposal in 2004 and 2010. In 2013, Mildura Solar Concentrator Power Station, a 1.5 MW demonstration plant, was commissioned by Silex Systems and it was expected to be expanded to 100 MW by 2017. However, in August 2014, the project was abandoned by Silex, due to lack of commitment to renewable energy by the Abbott government. The government's plans to scrap the praised Renewable Energy Target (RET) in Australia were cited as one of the main reasons for abandoning the project. International scientists criticised this decision extensively, claiming Australia risks being "left behind the rest of the world" if it cuts its plans for renewable energy. The decision to not build the plant may also cause electricity prices to rise significantly in the country. Another large development which has been controversial was the proposal for Mildura to be the site for Victoria's second casino. Rio Vista, the former home of Canadian engineer William Chaffey, built in the Queen Anne style. Since early settlement Mildura has been home to artists, writers and creative people. Organisations such as the Red Cliffs Musical Society, Eisteddfod, Mildura Ballet Guild and Mildura Country Music Festival have helped grow a reputation for home grown talent and creative community. The hub of this community is the Mildura Arts Centre, which began as a gallery space at Rio Vista House in the 1950s and became fully established in 1956 with the building of a new regional art gallery and performing arts theatre. In 2012, after two years of construction, the new Mildura Arts Centre opened. As of the 2016 census, there were 33,444 people residing in 15,320 households. Indigenous Australians make up 4.6% of Mildura's population. 77.4% of people were born in Australia. The next most common countries of birth were England 1.4%, Italy 1.1%, India 0.9%, New Zealand 0.9% and Afghanistan 0.8%. 80.0% of people spoke only English at home. Other languages spoken at home included Italian 1.7%, Turkish 1.1%, Tongan 0.8%, Hazaraghi 0.7% and Mandarin 0.7%. The most common responses for religion were No Religion, so described 33.1%, Catholic 21.8% and Anglican 11.3%. In 2018 Mildura recorded the highest rural crime rate in Victoria and the fourth highest crime rate in the state overall. Mildura has long been associated with the Calabrian Mafia, with claims made by police in 1966 that annual organised crime meetings were held in Mildura to co-ordinate nationwide criminal activities. In a 1960's National Anti-Mafia Directorate report by John T. Cusack (United States' Bureau of Narcotics) and Dr Ugo Macera (assistant commissioner of police in Calabria) claims were made that the "ancient Calabrian Secret Criminal Society known as the L'Onorata Societa" and the "`Ndrangheta" were operating "throughout the State, with large segments in the fruit growing and farming areas of Mildura and Shepparton" adding that "There are reports the Society has existed in Victoria since 1930". They have reportedly been involved in revenge killings, cannabis production and weapons purchases. During the 1980's the Mildura Mafia emerged as a major crime group that dominated marijuana production in Australia and ran an Australia-wide money-laundering network. Several notable mafia murders have been linked to the region including the suspected mafia hit on 43-year-old Marco Medici in 1983, police believe the murder may be connected to the assassination of anti-drug crusader Donald MacKay at Griffith in 1977. The 1984 murders of Melbourne gangsters Rocco Medici and Giuseppe Furina are also connected to Mildura through the Medici family. In 1982, 42-year-old Mildura greengrocer Dominic Marafiote and his parents were murdered after Marafiote gave South Australian police the names of Calabrian mafia bosses in South Australia, Victoria and New South Wales. In 2016 Mildura residents Nicola Ciconte, Vincenzo Medici and Michael Calleja were convicted and sentenced in Italy for their role in a plot to smuggle up to 500 kilograms of cocaine into Australia. Mildura has recorded significantly higher than average rates of Methamphetamine use. Rural methamphetamine use overall is 2.5 times higher than in metropolitan areas. Prior to 2010 rates of use of illicit drugs in rural areas were significantly lower than those in the cities. In 2014, a Mildura based Comancheros Motorcycle Club member and former Australian Defence Force (ADF) sniper, Joshua Faulkhead, was arrested after being caught transporting large quantities of methamphetamine, cocaine and ecstasy between Sydney and Mildura. Faulkhead was sentenced to nine years and five months in jail. In 2015, 20 people were involved in a large drug trafficking operation in Mildura in north-west Victoria. Methamphetamine, marijuana and ecstasy were seized in raids. The drugs seized were reported to be worth more that $15,000. $20,000 in cash were seized and a number of weapons were also seized. Later that same year, Stephen Gillard and Geoffrey Hitchen from South Penrith, were arrested for possession of $300,000 worth of methamphetamines in scrubland off the Mallee Highway at Tutye, west of Ouyen. Local farmers uncovered plastic fruit juice bottles containing the drugs after noticing the men behaving strangely the previous day. In 2017, a joint Australian Federal Police (AFP) and United States Drug Enforcement Administration (DEA) investigation lead to the seizure of $2.4 million in cash at the Mildura Airport, after 255 kilograms crystal methamphetamine were found at a storage facility in Northern California in June. the bust was part of an investigation into an alleged conspiracy to use a light plane to export drugs from the US to Australia. The 72-year-old pilot, a 52 year old man, from Zetland and a 58 year old Melbourne man were charged with conspiracy to import a commercial quantity of border controlled drugs and money laundering offences. The crystal methamphetamine was reported to be worth $255 million. That arrests were connected to $2.4 million which was found in Mildura, in a prime mover that was driven from Adelaide in April. Leigh Adams, retired Motorcycle speedway rider. Ten time Australian Solo Champion and the 1992 World Under-21 Champion. Including juniors, Adams won a total of 16 Australian championships and 4 World Championships. Jason Akermanis, Australian Rules footballer. Won the 2001 Brownlow Medal. Jason Crump, retired Motorcycle speedway rider. Australia's only triple Speedway World Champion (2004, 2006 and 2009). Phil Crump, retired Motorcycle speedway rider. The father of Jason Crump, he is a four time Australian Solo Champion and thirteen time Victorian Champion. Matt Dea, Australian Rules Footballer. Currently plays for the Essendon Football Club in the Australian Football League. Patricia Edgar, founding director of The Australian Children's Television Foundation. Edward Fowler "Ted" Hill (1915–88), barrister and communist activist. Rick Kelly, V8 Supercar driver. 2001 Australian Drivers' Champion, 2006 V8 Supercar Champion, and 2003 and 2004 Bathurst 1000 winner. Todd Kelly, V8 Supercar driver. Winner of the 2003 Bathurst 24 Hour and 2005 Bathurst 1000. Matthew Knights, former Richmond Football Club captain and former Essendon Football Club coach. Jason Lyons, retired Motorcycle speedway rider. 1999 Speedway World Team Cup and 2002 Speedway World Cup winner and a three time Victorian Champion. Kris McCarthy, Olympic middle-distance runner. Ron McEwin, (1928-1979) former Essendon VFL player. Chris Tarrant, Collingwood Football Club defender. Josh Waters Superbike rider, Suzuki works rider for 2014, winner of race 2 Brands Hatch BSB, 20 July 2014. Julia Zaetta, editor of Better Homes and Gardens. Tania Zaetta, Australian actress and television presenter. Local newspapers include the Sunraysia Daily, Mildura Midweek and Mildura Weekly. Online news sources include the Mildura Independent Star and RIVER1467AM News. Local radio stations include ABC Local Radio (National), RIVER1467AM (3ML)(Commercial), 97.9 Sun FM Sunraysia (Commercial), 99.5 Star FM (Commercial), and Hot FM (Community). Local TV stations include ABC Television (ABC1), SBS Television (SBS ONE), Prime7, WIN Television, Mildura Digital Television, 7Two, 7mate, GO!, GEM, ABC2, ABC3, ABC News 24, SBS HD, SBS Two, One HD and Eleven. The Sunraysia region, including the city of Mildura, was the first region in Australia to switch off analogue TV broadcast in the implementation of the country's DTV transition process. Mildura has nine Australian Rules football teams competing in the Sunraysia Football League; Imperials, Mildura, South Mildura, Irymple, Robinvale-Euston, Wentworth, Merbein, Red Cliffs and Ouyen United. Mildura also have a Junior Football League, ranging from age groups of under 10's to under 16's. Roller Derby is a growing sport in the region, with Mildura having their own league, (Mildura Roller Derby League) the team participates in competitions around Victoria and at least annually, will hold a tournament in Mildura. The Sunraysia Rugby League is also based in Mildura and has six senior men's teams competing for the annual premiership. Rugby league matches are played from May to September. The Sunraysia Cricket Association operates its competition between October and March annually. The SCA consists of 8 teams, Coomealla-Wentworth, Merbein South, Irymple, Mildura East, Mildura Settlers, Mildura West, Nichols Point and Workers-Gol Gol. Mildura has a horse racing club, the Mildura Racing Club, which schedules around nine race meetings a year including the Mildura Cup meeting in May. Golfers play at the course of the Mildura Golf Club on Twelfth Street. The Sunraysia Baseball Association plays during autumn and winter and has six baseball clubs in the league; Hawks, Saints, Eagles, Wanderers, Tigers and Tornadoes formed in 2010. Basketball also has a large following in Mildura with hundreds of teams in all divisions entered in the Mildura Basketball Association's summer league. Association football (soccer) also has a large following in Mildura, with there being a popular junior and senior league played during the winter months. The league consists of six teams, those being Three Colours, Mildura City, Mildura United, Irymple Knights, Nichols Point and Northern Suns. Mildura is a very motor sports oriented town. It has several tracks in the region to cater for different types of motor sports including the Mildura Kart Club (Go-Kart racing), Timmis Speedway (Automobile speedway), Olympic Park Speedway (Motorcycle speedway), Sunset Strip (1/8 mile drag racing), and North West Victoria Motorcycle Club. (Off-road motorcycle racing). The Mildura TT Circuit hosted the Australian TT in the 1950s. Mildura is on the intersection of the Sturt Highway from Adelaide to Sydney, and the Calder Highway to Melbourne via Bendigo. Deakin Avenue, the main street of Mildura, is known as the longest straight avenue in Australia, at 12.1 km. Sunraysia Bus Lines, BusBiz and Dysons operate V/Line bus services that connect Mildura to various parts of Victoria and southern New South Wales. Greyhound Australia run buses to Adelaide and Sydney via Canberra. NSW TrainLink run buses to Sydney. The Henty Highway Bus Service runs buses to Horsham. Mildura has a railway connection to Melbourne, which is used for freight transport. In May 2006, it was announced that the Mildura line would receive a $73 million upgrade using gauge convertible sleepers. Mildura Airport is the third busiest airport in Victoria, serviced by three QantasLink flights daily to Melbourne (with four services on Thursday & Friday), three Regional Express Airlines flights to Melbourne, with Regional Express flights daily to Adelaide, Sydney and Broken Hill. Virgin Australia has one flight per day in each direction between Melbourne and Mildura. In 1905, a small group of Sisters of Mercy came from Wentworth to Mildura and established a convent in a weatherboard building on the corner of Pine Avenue and Tenth Street. Catholic secondary education commenced in Mildura in 1906 when the Sisters of Mercy began conducting classes in rooms attached to the original convent in Pine Avenue. The Certificate of Registration of a School dated 31 December 1906, indicates that sub-primary, primary and secondary classes were being conducted from convent at the time. In 1911 boarding school facilities were provided in Olive Avenue and in 1914 a new school was erected in Walnut Avenue. The first buildings of St Joseph’s College at its present site were opened in 1929. The College has well equipped classrooms, science and computer laboratories, creative arts and design and technology complex, religious education centre, library, sports facilities, staff and student amenities. The College has been closely linked with the development of Mildura since the opening of the irrigation settlement by the Chaffey’s in the 1880s. For example, in 1890 the Governor of Victoria, Lord Hopetoun, laid the foundation stone of what was to become the Chaffey Agricultural College, but unfortunately, because of financial difficulties, the College was not built. In 1911, the Education Department of Victoria agreed to erect a high school on the Chaffey College site, and Mildura High School was officially opened in September 1912. The Diamond Jubilee of the school was celebrated on the 8 and 9 September 1972. They celebrated their 75th birthday in August 1987 and in 2012 celebrated their centenary over the weekend of September 14-16th. As part of a strategic plan by the Ministry of Education in 1990, Mildura High School changed its name to Mildura Secondary College to reflect the changing nature of educational delivery in secondary schools. Again as a result of restructuring in education provision since 1995 the College has been known as Mildura Senior College, catering exclusively for the final two years of secondary education. Mildura Senior College has a long and distinguished history of providing quality educational pathways to thousands of young people living in Sunraysia. Mildura Senior College caters exclusively for Year 11 & 12 students. In 2013 there will be approximately 500 students in Year 11 and 400 in Year 12. Entrance to Year 11 is open to all students living in the Sunraysia District who have successfully completed Year 10. The decision regarding the satisfactory completion of Year 10 is the responsibility of the 7-10 College. Enrolment at the College is also dependent on factors such as age, behaviour record and other achievements. Please see the section on enrolment for further information. Chaffey Secondary College is a Victorian State Government secondary school catering for students in Years 7 to 10 located in Deakin Avenue. In 2012 the college had 640 students enrolled. The college offers 120 to 140 different courses each term as part of its modular learning program. Students and families participate in a program of course counseling and student-led presentations each term to help students create the most appropriate course for their ability, pathway and interests. The college has a double-court gymnasium which it operates as a joint-use facility with the Mildura Regional City Council. The college operates a small theatre with seating for up to 220 persons. Sunraysia Institute of TAFE's main campus is located in Benetook Avenue. In 2008, the Institute had 6592 students enrolled. La Trobe University operates a regional campus in Mildura, with 500 students enrolled as of 14 February 2018. Two Australian Navy vessels have been named after Mildura, HMAS Mildura and HMS Mildura. The songs Mildura (Home of Mine) and Come to Mildura – the Land of Winter Sunshine were written by Reg. Stoneham in the 1920s. Mrs G. H. Ball’s My Old Home Town (Mildura) was recorded on the B side of John Collinson’s first recording of Waltzing Matilda in 1926. Wikimedia Commons has media related to Mildura. ^ a b c d Australian Bureau of Statistics (27 June 2017). "Mildura - Buronga (Mildura Part)". 2016 Census QuickStats. Retrieved 1 November 2017. ^ "Mildura Central". www.milduracentral.com.au. Mildura Central. Retrieved 18 June 2018. ^ "Exploring Mildura's History". www.visitmildura.com.au. Visit Mildura. Retrieved 18 June 2018. ^ "Irrigation of the Murray River". murrayriver.com. Discover Murray River. Retrieved 18 June 2018. ^ Mildura Homestead – Mildura Arts Centre Archived 6 July 2011 at the Wayback Machine. Yourartscentre.com.au. Retrieved on 18 August 2011. ^ Westcott, Peter (1979). "Chaffey, William Benjamin (1856–1926)". Australian Dictionary of Biography. Australian National University / Melbourne University Press. Retrieved 22 February 2007. ^ a b c d "Mildura". Sydney Morning Herald Travel. Retrieved 8 February 2004. ^ Mildura – Wyperfeld NP Archived 3 March 2016 at the Wayback Machine. 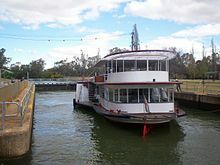 Visitmildura.com.au (18 June 2007). Retrieved on 18 August 2011. ^ a b "Climate of Mildura". Bureau of Meteorology. Archived from the original on 14 September 2010. Retrieved 7 August 2010. ^ a b "Monthly climate statistics". Bureau of Meteorology. Retrieved 12 December 2016. ^ Iles, Kieran. (16 August 2010) New voice for Mildura growth – Local News – News – General Archived 22 August 2011 at the Wayback Machine. Sunraysia Daily. Retrieved on 18 August 2011. ^ Victorian government may help build a solar power plant at Mildura. Watoday.com.au (22 September 2010). Retrieved on 18 August 2011. ^ "Silex falls victim to erratic policy". The Australian. 18 August 2014. Retrieved 21 August 2014. ^ "Uncertainty over Mildura's solar future after plant shelving". ABC Online. 19 August 2014. Retrieved 21 August 2014. ^ "Solar farm abandoned over uncertainty over renewable energy target". The Sydney Morning Herald. 18 August 2014. Retrieved 21 August 2014. ^ Wilson, Iain (19 August 2014). "Biggest solar project falls as Australia reviews policy". Bloomberg (US). Retrieved 21 August 2014. ^ "Silex shelves major solar plant on RET uncertainty". ABC. 19 August 2014. Retrieved 21 August 2014. ^ "Completion of Australia's largest solar plant at risk". RT Business. 19 August 2014. Retrieved 21 August 2014. ^ "Abolishing Renewable Energy Target will increase cost of electricity, company profits: report". ABC Online. 18 August 2014. Retrieved 21 August 2014. ^ Mildura casino plans unveiled – ABC News (Australian Broadcasting Corporation). Abc.net.au (26 March 2010). Retrieved on 18 August 2011. ^ "Welcome to the 2016 Mildura Show - The Mildura Show". The Mildura Show. ^ Kerr, Jack. "Victoria's crime rate has fallen again, figures show". ABC News. Australian Broadcasting Corporation. Retrieved 9 February 2019. ^ "Why the Calabrian mafia in Australia is so little recognised and understood". The Conversation. The Conversation Trust. Retrieved 11 February 2019. ^ Moor, kieth. "Secret dossiers probed Godfathers behind Melbourne's mafia bloodshed in the 1960s". Sydney Morning Herald. Fairfax. Retrieved 11 February 2019. ^ Silvester, John. "I infiltrated the Mafia - but at a terrible cost". The Age. Fairfax. Retrieved 11 February 2019. ^ Murphy, Allan. "Medici murder". Sunraysia Daily. Elliott Newspaper Group PTY Ltd. Retrieved 11 February 2019. ^ Moor, Kieth. "Mafia's dark secrets". Herald Sun. News Limited. Retrieved 11 February 2019. ^ Baker, Richard; McKenzie,, Nick; McKenna, Jo. "Italy convicts local Mafia". Sydney Morning Herald. Fairfax. Retrieved 11 February 2019. Moor, Kieth. "Police have new leads in the 1984 Calabrian mafia murders of Rocco Medici and Giuseppe Furina". Herald Sun. News Limited. Retrieved 11 February 2019. Solomons, Mark. "Drug trafficker owns operation at centre of strawberry scandal". Sydney Morning Herald. Fairfax. Retrieved 11 February 2019. King, Charlotte. "Print Email Facebook Twitter More Bikie gang 'hooking rural youth on ice'". ABC News. Australian Broadcasting Corporation. Retrieved 16 February 2019. Baker, Richard; McKenzie, Nick. "Ice use devastating rural Victoria". The Age. Fairfax. Retrieved 16 February 2019. Thals, Kaitlin. "Mildura project hailed a 'major success': Ice crush". Sunraysia Daily. Elliott Newspaper Group PTY Ltd. Retrieved 16 February 2019. Percy, Karen. "Government taskforce targets ice trade in Mildura". ABC News. Australian Broadcasting Corporation. Retrieved 16 February 2019. Woodburn, Joanna. "Ice use in rural Australia double that of metropolitan areas, drug report shows". ABC News. Australian Broadcasting Corporation. Retrieved 16 February 2019. ^ "Former ADF sniper and Comancheros bikie boss sentenced to nine years' jail for drug trafficking". ABC News. Australian Broadcasting Commission. Retrieved 13 March 2019. ^ "'Ice', cannabis, ecstasy seized in Mildura drug raids". ABC News. Australian Broadcasting Commission. Retrieved 13 March 2019. ^ "Pair plead guilty over methamphetamines found buried in remote bushland at Tutye near Ouyen". ABC News. Australian Broadcasting Commission. Retrieved 13 March 2019. ^ "Three arrested as police bust alleged conspiracy to fly ice from California to Australia". ABC News. Australian Broadcasting Commission. Retrieved 13 March 2019. ^ Anderson, Hugh. Hill, Edward Fowler (Ted) (1915–1988). Canberra: National Centre of Biography, Australian National University. ^ "Country Vic first with digital TV switch". The Sydney Morning Herald. 30 June 2010. Retrieved 2 July 2010. ^ Full Points Footy. "Sunraysia Football League". Archived from the original on 21 March 2009. Retrieved 15 April 2009. ^ Country Racing Victoria. "Mildura Racing Club". Archived from the original on 19 July 2008. Retrieved 7 May 2009. ^ Australian Harness Racing. "Mildura". Retrieved 11 May 2009. ^ Golf Select. "Mildura". Retrieved 11 May 2009. ^ "Mildura Kart Club". Archived from the original on 22 October 2017. Retrieved 15 December 2018. ^ "Timmis Speedway - Mildura, Victoria". Timmis Speedway. Archived from the original on 21 February 2016. ^ "Mildura Motorcycle Club - Olympic Park Speedway". ^ "Northwest Victorian Motorcycle Club". ^ "Roads, ports and freight – Mildura Rail Freight Upgrade". www.doi.vic.gov.au. Archived from the original on 4 June 2009. Retrieved 4 June 2008. ^ "La Trobe University Mildura". La Trobe University. Wikivoyage has a travel guide for Mildura. Watch historical footage of Mildura and surrounds dating from 1920-2001 from the National Film and Sound Archive of Australia's collection. This page was last edited on 20 April 2019, at 00:09 (UTC).